As noted in earlier postings, a number of factors suggest that the vast majority of cylindrical jars were not intended for the storage of literary or Biblical scrolls. These include (1) the small percentage of scrolls that had actually been stored in jars, (2) the presence of jars set into the ground at Kh. Qumran for purposes other than scroll storage, and (3) the discrepancy in height and width between the jars and the scrolls. What then was the intended use of the cylindrical jars of Qumran at the time of their manufacture? A significant clue as to the intended use of these jars lies in one example from Qumran Cave 3 (= Survey Cave 8). Jar no. 10 had the letter tet incised into the neck and shoulder before it was fired, indicating that it was manufactured to be a tithe vessel. The use of the names or letters was to distinguish jars related to the tithe for various uses. 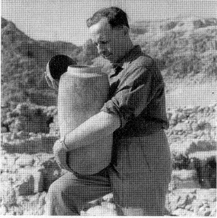 The practice of placing a taw or tet on the shoulders of standard storage jars to indicate that its contents were either for the terumah (priestly tithe from produce) or tevel is attested at Masada on standard storage jars which otherwise bear no distinctive features. At Qumran, the system was less complex. The inclusive phrase keley dema’ was used to designate the jars used for the general terumah. 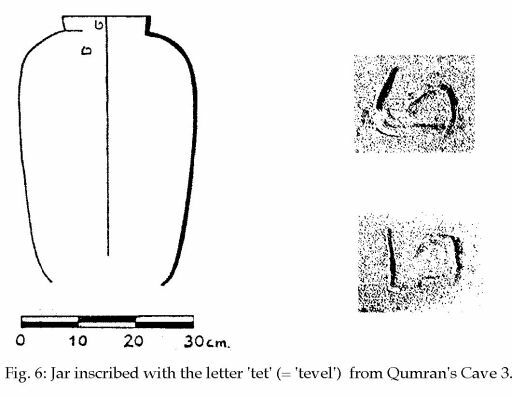 The distinctive and rather uniform shape of the tithe jars from Qumran would have rendered the taw mark of terumah unnecessary as a distinguishing feature. The only instances where a mark would have been of use were those in which the jar was intended for another, more specific purpose, e.g., to contain food products that were tevel, as in the case of Jar no. 10 from Cave 3. 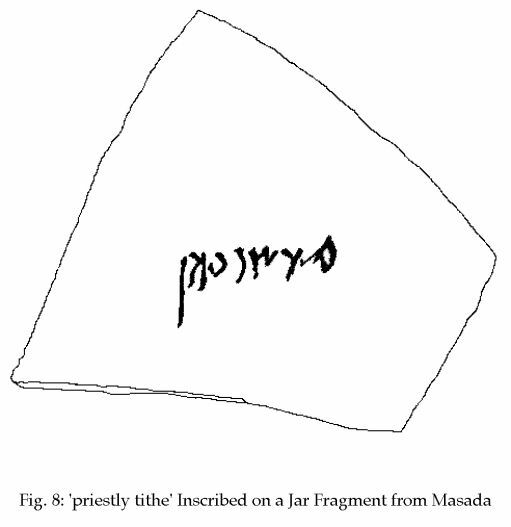 In order to ensure the purity of a jar and its contents for priestly consumption at a standard acceptable to the Qumran community, special jars and lids were made that would be designated solely for priestly tithes. Jars were manufactured which were large enough to contain at least one, two, or three seahs of produce (approximately 15, 30, or 45 liters, respectively; cf. chart). The jars were generally made without loop handles. They were carried in the arms, hugged close to the chest (cf. e.g., the picture of John Allegro clutching such a jar). This method of carrying was intended to protect the jar against possible nicking or breakage, which would render it, and its contents, halakhically unclean and unfit for priestly use or consumption. The mouths of these jars were sufficiently wide to allow the filling and extraction of dry produce with measuring cups (perhaps of stone), without nicking the rim or spilling the contents. Lids which were wide enough to enclose the rim needed to be affixed to the jar in order to prevent impure items from falling in. In many specimens, the lid was tied down to two or three pierced ledge handles on the jar’s shoulders (cf. earlier posting). The lids were also made of kiln-hardened clay so that the jar could be opened and closed numerous times without the risk of disintegration (as would happen with the more commonly used and smaller clay jar stoppers). S. Pfann, ‘Scroll Jars, Tithe Jars, or Both?’ Proceedings of the Manchester Copper Scroll Conference, edited by George J. Brooke and Phillip R. Davies. JSP Supp. Sheffield Academic Press (2002).